This week, I’m going to be talking about red herrings. First, however, a very important fact – in a CoC pbem, there are no red herrings. But how can this be, I hear you cry. Surely red herrings are one of the crucial factors of any investigation-based game? Otherwise, every clue would point to the solution and the adventure would be over before it had begun. Except of course that in our sandbox model of adventure construction, there is no pre-determined solution and therefore the party cannot be diverted from something that does not yet exist. All right – let’s redefine the topic of conversation. Let’s call them the alternate possibilities of the adventure. Things that don’t seem to relate to the direction that the adventure is taking and yet, if spotted and followed can lead to what might seem to be a blind alley of investigation. Of course, the last thing that a Keeper wants is for the party to be overwhelmed by choice – therefore, a sense of proportion is essential. Perhaps four or five leads that might result in something significant if the party chose to follow them up is fine. This also means that the entire adventure is not stalled if the party encounter a lead that they cannot, either through luck or misapplication, solve or deduce on their own. As well as active and immediate alternative possibilities, the Keeper should also toss in references which may have nothing to do with the current adventure but which broaden the game world that little bit more. These might be called displaced adventure opportunities, since they can either be followed at once (if the party feel like it) or noted and kept for later. Such is the nature of sandbox CoC that these references can often take on a life of their own even if they are not taken up immediately. The living nature of a sandbox world means that displaced opportunities will develop and change with time and the adventure a party takes up eventually may be different in many respects from the one that they might have encountered had they acted on the reference immediately. 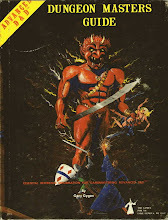 And if the campaign is a multi-Keeper one, a new Keeper may want to pick up an aside in the previous Keeper’s adventure and flesh it out into a full-blown adventure of their own. Of course, it may be that there are alternative possibilities and displaced opportunities that are never taken up. Such is the way – there’s always more that the Keeper can invent than can be investigated even by the most active (and fortunate) party. That’s fine – they can become a part of the tapestry that makes up the world’s backdrop. 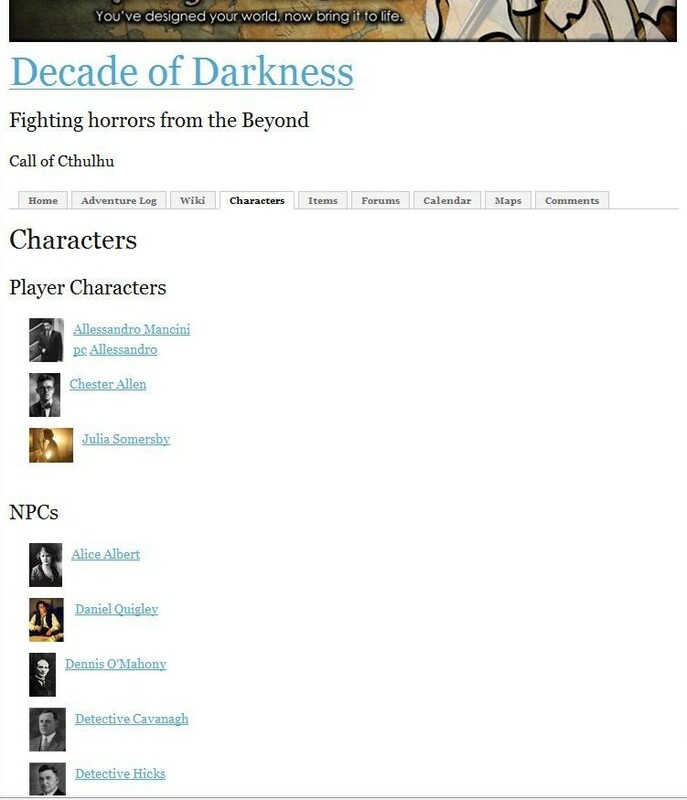 Other parties, NPCs and the like may choose to investigate them, becoming either successful investigators or – more likely – horribly mutilated corpses to be encountered by a future band of player characters. All the more affecting if the NPCs were known to the players and with it, the realisation that it could so easily have been them. "Do the smart thing - let somebody else try first"
Step up to the podium, Anthony Hunter of Battleaxes and Beasties! It was a close race with both this entry and Arkhein's Oyster jostling for the lead but in the end, the people have spoken and your design will now grace the Wiki. Congratulations to you, Anthony - commiserations to the runners-up. Great efforts by all concerned, and thanks also to everyone who voted and commented on the posts in question. I hope everyone's had a great Easter; I spent mine with good friends and family and loved it. The party is wandering through a section of the dungeon that seems quieter than others. They might even think about using it as a base for rest periods and from which to explore. This, of course, would be a bad move because not long after they enter the area, they hear an unearthly wail, a scream that sounds as if no human mouth could utter it. Then he will walk further on down the corridor and through another door, nowhere near as heavily fastened. The even tougher man, we will call The Warlord, although you can give him whatever name you want. He is Lawful Evil in alignment, cruel but organised, wielding control over his men with an iron fist and the promise of large amounts of gold. He has heard rumours of a fabulous treasure several levels down, hidden behind fearsome defences and protected by traps and magical barriers. However, he now believes that he has a way to get to this treasure – some time ago, he and his men captured (at considerable loss to themselves) Mazoriax, a Beholder who had previously been lording it over this area of the dungeon. The Beholder was overpowered, its eye stalks cut off and then it was chained up in the room with the heavy iron door. The Warlord has been interrogating it to try and persuade it to give up what it knows about the treasure hoard. He has a magic user, several fighters, a couple of thieves and two clerics, master and acolyte, of his LE god. The magic user is busy applying red-hot pokers and branding irons to the beholder in an attempt to force it to tell its secrets. He also has iron shears and pliers which he uses, heated to a cherry-red temperature in the brazier in the confinement room, to remove any eye stalks that look as if they are growing back. The main eye has been securely covered and the Beholder is fastened very securely in chains that keep it in place, albeit hovering some feet off the floor. The beholder (eye tyrant, sphere of many eyes) is most frequently found underground, although it infrequently will lair in desolate wildernesses. The globular body of this monster is supported by levitation, and it floats slowly about as it wills. Atop the sphere are 10 eyestalks, while in its central area are a great eleventh eye and a large mouth filled with pointed teeth. The body is protected by a hard chitinous covering. The creature's eyestalks and eyes are also protected, although less well (thus the armour classes of 2 and 7 respectively). Because of its particular nature the beholder is able to withstand the loss of its eyestalks, these members are not computed as part of its hit point damage potential, and lost eyestalks will eventually grow back (1 week per lost member). The body of the monster can withstand two-thirds of its total damage potential, while the great central eye can withstand one-third this total, i.e. a beholder with 45 hit points can withstand 30 hit points of damage to its body before being killed; the eleventh eye can withstand 15 points before ceasing to function. Eyestalks take from 8 to 12 hit points each before being lost. The body of a beholder represents 75% of potential hit area, the central eye and the eyestalks 10% each, and the 10 small eyes 5%. The warlord also keeps a statue of a man in a horrified pose of agony where every one of his henchmen can see it. This is what happened to one of his men when the beholder was negligently allowed to recover one of its eyes. The Beholder, whilst nominally Lawful Evil has been driven to the point of insanity by the torture and is now more CE than LE. Nevertheless, it is still extremely intelligent and very cunning and may appeal to the better nature of the party to assist its escape and end its torture. If the party is of Good alignment, they may have very firm views on maltreatment of creatures, even if they are evil. The DM can really play up the moral quagmire into which the party have stepped if they get involved in this particular adventure. The treasure may really exist or it may not. The beholder may be taking the party for a bunch of suckers. Bear in mind that its current mental state and shift in alignment will not be known initially to the party and so they may be expecting more Lawful behaviour from it. If the treasure does exist, it will probably be based around, but much, much expanded upon the treasure types belonging to the beholder. Treasure type I is heavy on gems and jewellery, with a slight chance of magic and a moderate chance of platinum. Type S is potions whilst T consists entirely of scrolls. This could be bulked out with Type H, the one type we all hope to come across and maybe V for extra magic. Of course this hoard will be phenomenally well-guarded and although the beholder will know quite a bit about how to deactivate the traps and bypass the explosive runes, spectral guardians etc, he won’t know everything. That’s why he needs the party. It’s up to them to decide whether they trust him or not. Do you like macabre and unsettling pictures? Then this link is for you. He's done a series of horror photographs on Pickman's Model and the portfolio is pretty cool too. Don't forget to check out his blog for more details. 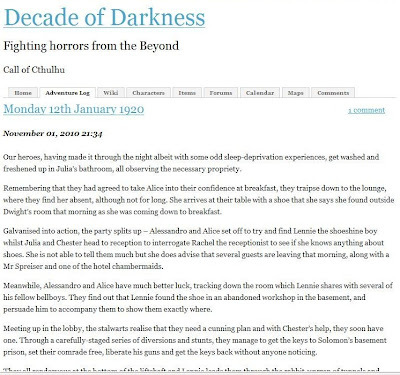 Ever wondered why so many Lovecraft stories involve the protagonist hurriedly writing a scribbled account of his experiences while the eldritch horrors are closing in? It’s a truism in Call of Cthulhu that if you don’t run away, you’ll end up dead. Actually, you’ll end up dead if you DO run away if that monster is faster than you. Probably should have started running earlier. Generally, however, if the Keeper is doing his job right, a TPK should only really happen in Call of Cthulhu if the party is dumb enough not to run away if the signs are bad. If they do all the right things, make preparations, take a truckload of ammo AND run away as soon as the tentacles appear and still die, then something’s wrong with the adventure. The aim of a Call of Cthulhu adventure is to scare the party witless, give them a hell of a good time while this happens and maybe, just maybe somebody will die if they’re dumb. Setting an adventure up so that even a well-prepared party has no chance is verging towards Killer Keeper territory. If the party doesn’t spot that they had no chance and were doomed from the beginning, they’re going to hang around in KK territory for a long time. Chances are that a Killer Keeper wants the party to see just how awesome his final set piece showdown is. He’ll have gone to a lot of trouble to set it up (not having read Part Three of this series) and is looking forward to showing everyone his horror chops as he devours, mutilates and generally trashes the hapless band of investigators. Of course, it might not be that bad. A Keeper might not realise that he should spare the axe if the party has done everything it should have done. In my Majestic adventure, the party (and this is probably the first time I’ve admitted it) never got to see the Big Bad. Encounters with crazy hillbillies (oh, and green slimy tendrils, which was a bit of a hint as to what they might meet later) were enough to persuade them that the hotel should be given a One-Star rating and probably set on fire. In fact, one of them tried to do just that. But when I realised that they were not going to take that final journey into madness and nightmare, I stayed my hand. They were having a great time and I went with the flow. Many parties will look back on the narrow escape that they had and thank their lucky stars that they didn’t turn that corner, open that crypt, read that book. Of course, not having defeated the Big Bad, they won’t regain any SAN points but hey, that’s the price of life! Another important thing to consider when talking about mortality in CoC is that when designing an adventure, or even sketching it out in a very rough form (which of course you all do now, don’t you, after Part Three?) 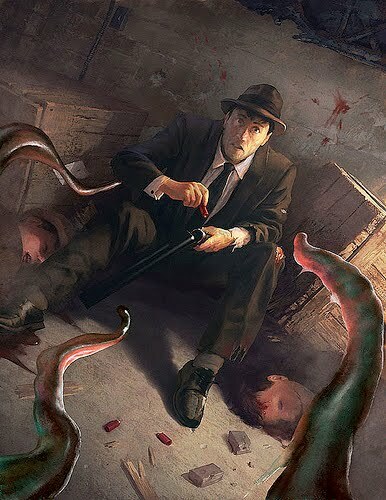 a Keeper should remember one thing that is certain about life in Call of Cthulhu – anyone can die. And often very easily and very unexpectedly. Yes, the character may have been stupid and yes, it’s a great shame and a tragedy to boot but death is likely. Very likely. So likely in fact that it’s a very bad idea to structure an entire adventure on the assumption that a particular person will survive it or live long enough to carry out a particular task. Or that a particular scenario or instalment of the adventure can only be solved by a particular character’s particular skill. 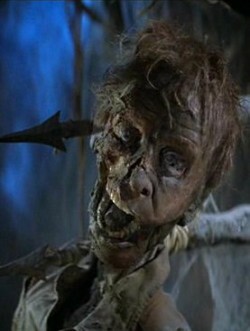 If only one character has the ability to telepathically see through solid objects and you’ve taken this into account when setting up the fiendish death trap in the cellars of Count Morbidius, then that character had better still be alive if the party is not going to be in deep doo-doo in said cellar. Hanging the entire adventure, or salient features of it, on that particular character being in possession of all their body parts means one of two things – either the adventure is going to nose-dive rapidly after the Grim Reaper has come to call or the Keeper is going to have to move heaven and earth to keep that character alive, and that means taking delivery of a wagon load of fudge. It’s much better to avoid this before it happens. Okay, I hear you cry, I’ve got a really dumb party and things look as if they’re heading towards a TPK – they’ve not run away or, perish the thought, their Internet dice rolls have gone really badly. What do I do? If they are all in the cellars of Count Morbidius and something has gone very badly wrong, then I would personally handwave the scribbled note phenomenon for just this one instance and advise them that you’ll be adopting it as a house rule next adventure. They won’t have to say they’re doing it, you’ll just take it as read that they are. Back-up characters – as smart a move as taking a clean set of underwear to an abandoned crypt under Boston. It’s generally a good idea to have said characters tied in to the current characters in some way – colleague, nephew, friend, parish priest, investigative reporter, that sort of thing. Linked but not too closely. This gives the new character, who may (I wonder why?) be coming into the adventure at very short notice an almost instant hook. By the time the adventure has finished, said character will have perfectly legitimate reasons for hunting down the horrors from the Outer Darkness. Is it a good idea to have a player bring a new character into an adventure that is half-over if his original character has been killed? I’d say it depends on the player – if you know the player and feel sure that he will run that character without using foreknowledge or information known only to his original character (this is assuming that the OC didn’t leave a log of his doings) then fine, there is no real reason why not. Leave a believable amount of time for the new character to appear – not minutes after the OC has hit the ground, torn to pieces by a Byakhee. The other plus about having a back-up character is that, even if they are never actually needed to step into the breach (or, let’s be realistic here, there is a slightly extended period of waiting for them to do so) they can in effect have a little life of their own. The Keeper can, with all due respect to the player whose character it will be, contribute events and happenings (interesting but not fatal) that the back-up character can experience. They may even write to the current character to tell them about it. That’s what I call pre-emptive hooks. Nothing too strenuous but enough to give them a link to the current party and perhaps a bit of backstory and knowledge that they can dip into if they need it. With the pbem’s miniverse evolving as you play, this is another facet of the bringing to life of the setting – making it all that much more believable and realistic. Next time, I'll be smelling something fishy - red herrings and how to make the best use of them. Remember that post "If you go down to the woods today?" Well, using Cute pdf writer, I've made the full thing available as a pdf on Dropbox. EDIT - I've now taken the PrintFriendly coding out of my blog HTML as it seems it was causing problems for the downloading. Thanks to Biopunk for highlighting that problem. It should work now. Let me know if you still have problems. Vote for your favourite Wiki Logo! The time has come - the people must choose. Let the voice of democracy speak! Okay, calm down - it's the Wiki Logo vote. I've set up the poll for the three entries we've had and you've got till Good Friday, 22nd April, to cast your vote. This week, I’m dealing with a very handy tool to make the administration of a pbem much easier. I’m talking of course about Obsidian Portal. 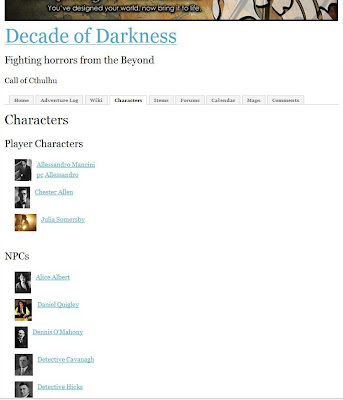 Those of you who have used OP already for other adventures can vouch for the fact that it has few equals as a repository of information for adventures, useful for both players and GMs. The way in which OP can be used for a pbem differs depending on the type of pbem that you’re running. If, like our group, you are using rotating Keepers, i.e. a different Keeper for each adventure, then the use of OP’s Secret Information Facilities is going to be very difficult, if not impossible. However, if you just have the one Keeper, then the ability to store information and keep it hidden from the players, who only get to see one aspect of the wiki page is very handy. 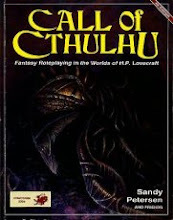 With Call of Cthulhu run sandbox-style, there needs to be a record of a great many details which, in a tabletop version of the game would just slip by if the players didn’t immediately take them up. Bit-part characters can be created and there is a fluff and crunch format that allows biography in one section, stats in another. Since with an evolving plot, it is very difficult to tell in advance who’s going to be the lynch-pin of an adventure, access to details on various characters, even the supposedly minor ones is crucial. If you as the Keeper are setting up the wiki, it is important to let the players know where it is and how to get into it. They should be encouraged to check it out and familiarise themselves with it. The Keeper should not touch the character detail sheets unless consultation with the player has been conducted. Likewise, the players can alter details on things like the events log and the wiki pages but should not unless there is a very good reason, e.g. the Keeper has misremembered something, and even then agreement should be gained for the alterations, otherwise it becomes a free-for-all and the value of the wiki is diminished thereby. These are two sample pages from our OP wiki. And this is from a wiki that I respect and admire greatly - Cthulhu Supremus Est. This guy knows how to use OP very well indeed and the results can be seen here. Used well, OP can be a very stimulating and useful tool. It brings a campaign to life in a way that little else can – it also means that new players can mug up on the past history of the campaign without having to get a twenty page update from the Keeper or be forever wondering what the in-jokes are all about. "I've never done a PbM/PbEM/PbP game before, so one thing I'm curious about it combat. I know there isn't a lot of combat in Cthulhu games, but (at least in the CoC games I've played), there is some. How do you handle that in a PbEM game?" Well, Martin - the rule book does give some very clear rules on how to handle combat on the table-top and pbem is very similar in that respect – order of fire, damage, hit points, time to reload, dexterity and its effect on who goes first (I won’t quote page numbers because it’ll be different for each edition). It’s best if players and Keeper establish a baseline at the start of the adventure for which rules they’ll be using. This saves arguments in the heat of the moment. As for dice rolls, we used a mixture of Secure Dice rollers and manual methods to work this. The Secure Dice roller seems to have a mind of its own when it comes to generating scores – I’m sure I’ve failed more rolls in this current adventure than I ever did rolling by hand. Regarding the scene of the action, I find that a quick sketch map of a room or cave or whatever with the positions of characters and NPCs can be scanned in and e-mailed to the players – this makes sure everyone knows who is where and who can hit whom. I found that with ammunition and shots fired, it’s best if both Keeper and player keep a record of this so that arguments can be swiftly settled if they arise. As with all the game’s systems, what applies to the good guys applies to the bad guys, who have the same vulnerabilities and the same limitations on ammunition and combat skills. Remember that combat is very dangerous in CoC – one good shot can take out a much-loved character and that’s before we get into the horrific damage that even the low-level monsters can do. Of course you could always do what one of our players did and construct your own blast bomb out of oil cans and shotgun cartridges. That seemed to work okay. Next time I’ll be looking at a very frequent occurrence in Call of Cthulhu – character deaths and how to handle them. Deep in the ruins of the Caverns, all is not well. A band of dwarf and gnome miners have stumbled across a rockfall and, keen to find out what is on the other side, have broken through. What is on the other side, however, is a colony of Boring Beetles. There’s nothing boring about this monster, however, as they have made mincemeat of the dwarves’ fighters and now block access to the chambers beyond. The dwarves need help and that’s where the party comes in. The little guys will promise a generous share of whatever is found on the far side of the breach in return for the assistance of the party in ending the chitinous menace. The average of 3-18 is of course 10.5, which I think we shall generously round up to 11 beetles, which is a respectable 55HD of damage these beasties can take. There is a good chance that the party will run across the beetles first and then the dwarves and gnomes, who are hiding out nearby, having built defensive works to stop them being attacked. If this is the case, then the little guys will weigh in to tilt the balance of combat in favour of the party, and drive the beetles back towards the breach. Beyond the breach is the lair of the beetles. There, they have, as detailed in the MM, been cultivating moulds, slimes and fungi for food. Industrious, aren’t they? There is of course a good chance that some of these tasty morsels are of the ‘bad for the health of the party’ variety – yellow mould, green slime, violet fungi and of course our old friend the shrieker. Deep in the heart of the beetles’ tunnels, there lies something that will give the dwarves and gnomes cause to reconsider their deal with the party. 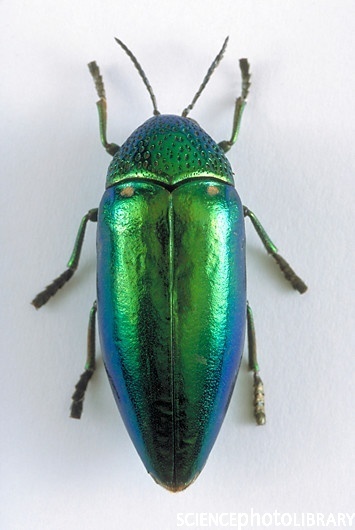 I’m not talking about the treasure garnered by the beetles over the years, although that is pretty impressive. No, this is an outcrop of rock in which sparkle glittery crystals. Hundreds of them - or at the very least, dozens. Turn to page 25 of the DMG. That’s the table to roll on. They are currently un-mined and unfinished but if dwarven miners get a chance, that could very well change. Of course, the dwarves are now beginning to regret having been so generous in their offer of recompense and will start thinking about how to ‘arrange’ things so that the party might not get to collect their reward. C,R, S and T treasure type is a very interesting combination and if the rolls go right, could give a spread that runs all the way from thousands of copper pieces right up to scrolls and potions. The probability is tilted towards higher value coins – 40% likelihood of 2000-8000 gp and 50% 1000 to 6000pp is pretty good, and that’s even before you factor in the 55% and 45% for gems and jewellery respectively. It could be that the beetles currently inhabit an old dwarven fastness or lair and this will give the dwarves even more reason to stake their claim and defend it, especially if they find dwarven skeletons and armour lying around. And of course, all this precious metal in such heavy concentrations, along with gems in both their finished and unfinished state might attract the attention of a Xorn. If the DM is feeling very sadistic. This week, we’re going to be looking at a way to reduce the amount of work that a Keeper needs to put into the game. 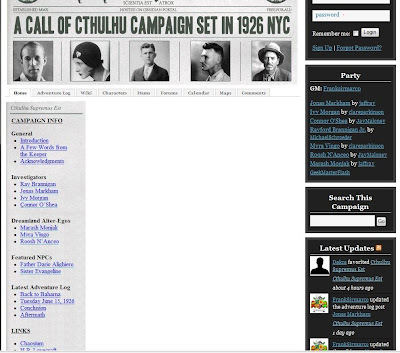 For many, Call of Cthulhu is a very linear game. The investigators probe Mystery A, get clue B which leads them to Mystery C, and so on until Denouement Z, where death, insanity or (possibly) survival await them. This is the format which many, but not all, of the published scenarios embrace. Even those which do not follow a strictly linear path nevertheless intend that the party arrive at a certain point or the world will end/R’lyeh will rise/Very Bad Things will happen. What I propose is, to be frank, a sandbox Call of Cthulhu. Although there may well be a sketchy idea in the Keeper’s mind of where he wants the adventure to lead, it needs to remain just that – sketchy. In this version of the game, nothing is firmed up further than perhaps two steps ahead of the party’s current location in the unfolding narrative. You will remember what I said in an earlier post about the game being almost like watching a horror novel write itself? Well, the narrative structure in sandbox CoC is exactly that – only becoming fixed once the party has actually done what they are doing. Before that, there are a number of different outcomes for any particular course of action. It’s a bit like a role-playing game designed under the Copenhagen Interpretation. So, the Keeper needs to stay two steps ahead of the party and no further. To do otherwise would lead to an explosion of possibilities which few Keepers have either the time or the energy to handle. It’s usually fairly easy to work out the possible outcomes of a single course of action and make plans for them. Indeed, the advantage of the pbem format, with its turnaround time of days rather than minutes is that the Keeper has the time to react to what the players do and the time to prepare new material and new avenues of investigation. Of course, what the Keeper needs to remember is that the party should be under no obligation to pick a particular option, even from a limited number of offered alternatives. One of the disadvantages (if indeed it can be called that) of working this way is that some of the material developed is never used – I’m afraid that this is just the way the adventure goes. There is always the option of recycling stuff that doesn’t get its day in the sun. This is a perfect example of why it is not a good idea to plan too far in advance. No doubt you’re a creative person who puts a lot of effort into your game. Without some form of self-restraint, you may become overly enamoured of your creations and go out of your way to ensure that your work is not wasted – we’ve all done it in the past. If you have not done the work in the first place, the temptation to railroad the players into it is avoided. Part of the fun of CoC pbem is the thrill of watching something new and unexpected develop. Flying by the seat of one’s pants sometimes generates the sort of game developments that might never result from endless planning sessions and careful deliberations; it’s like automatic writing – you’re tapping into something in your subconscious, raw creative energies that come coiling out of you, living and breathing. You’re laying story-larvae – don’t smother them, watch them grow! In order to make sandbox CoC work, the miniverse in which the Keeper’s game is set needs to be introduced into the developing narrative landscape of that game. 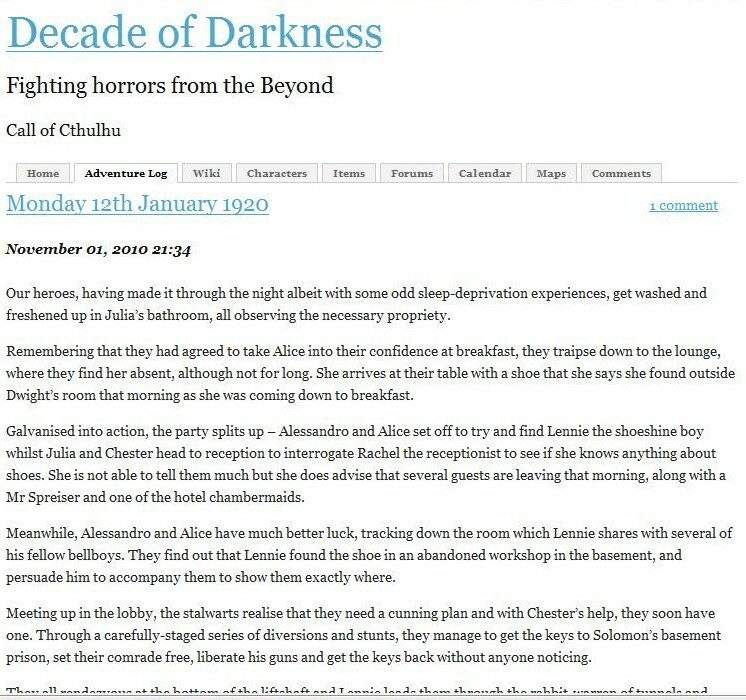 If hints, mentions, suggestions, fragments of mysteries and events connected to - but not necessarily immediately germane to - the adventure in play are slipped into conversations by NPCs or even the format of newspaper clippings, a network of hooks, ripe with potential can be developed, from which the players can make choices – and meaningful ones at that. It takes a certain amount of mental flexibility to adopt the sandbox approach to CoC. Some people like to know where they are going before they set out. Others get nervous at the amount of work they think is needed for this approach – although we have seen that this is not the case. Others like to get very creative with all elements of the adventure they’re writing and then become locked into that because they have an urge, understandably so to let the players experience their creation in all its glory. So, Keepers need to pry their fingers off the handlebars, so to speak, and maintain the lightest of touches on the future of the adventure. This is not always an easy thing to do, especially for those who have come to CoC from the adventure path end of the gaming spectrum. Nevertheless, the rewards are immense – players really do feel as if they are masters of their own destinies. The converse of this, of course, is that they have no-one else to blame if they fail. Of course, much of what has been written in this post will make using pre-written scenarios very difficult, unless you are the sort of person who views the booklet in your hand as a starting point, nothing more, and feel yourself under no obligation to use all of it. If you are, that’s fine. Take it, dismember it, gut it, fillet it. Throw away (or store for later) the bits the party just don’t seem to want to know about. Scribble your own notes in the margins, change the names, change the towns. Download your own pictures. You’ll be amazed at how quickly someone else’s material becomes your own. Next time, I’ll be talking about a very valuable tool for keeping tabs on all these adventure elements.